If your like most people, it’s hard to just jump into a new fitness/nutrition regiment and stay motivated to complete and achieve your ideal results. 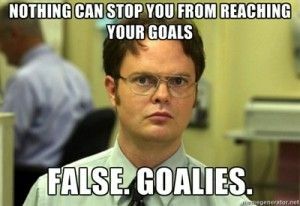 Thanks for that Dwight. What I have found by working with Patients and Clients is that when there is a goal that you have personal investment in, it is significantly easier to stick to your program and get those results. Here are 4 steps to accomplishing your fitness goals this year. A guy can dream can’t he? While our chances of getting on the actual show are pretty slim, I invite you to live vicariously through my friend Mike who will be competing on the show this year!! Mike is no stranger to overcoming obstacles as you will see in the video above. Keep an eye out for Mike Diatte (and yes you can say that he is a friend of a friend of yours while you’re watching it) on American Ninja Warrior this summer. How are you going to accomplish your goal? Does emphasis need to be placed on cardiovascular, strength, power, coordination, or a combination of the previous? Feel free to reach out to me for advice for your workout routine so you can accomplish your goals! Accountability is key to making sure that you stick with your program. Studies show that when you have a group to exercise with, you are more likely to continue with your exercise program and achieve better results. Commit to a weekly training schedule and for your event weekly to make sure that you are ready to dominate it! How much and how hard should I exercise? Get Specific Exercise Programming for your Goal! Harden SM, McEwan D, Sylvester BD, et al. Understanding for whom, under what conditions, and how group-based physical activity interventions are successful: a realist review. BMC Public Health. 2015;15:958. doi:10.1186/s12889-015-2270-8.